(April 25th, 2016) Vietnamese President Tran Dai Quang has asked for Japan’s continued assistance in helping Vietnam deal with climate change, which has been linked to saline intrusion in the fresh water of coastal areas as well as to drought. He said that climate change is an urgent issue and needs long-term solutions. 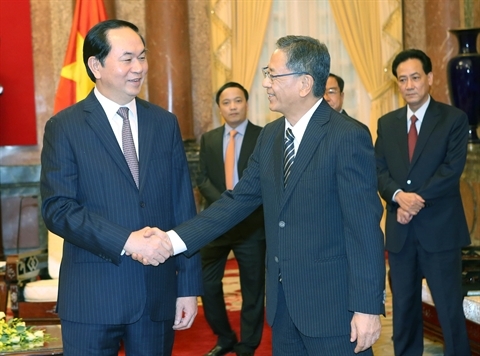 He make the request in a meeting with Japanese Ambassador to Vietnam Fukada Hiroshi in Hanoi on April 19. The president also thanked Japan for its support for Vietnam’s economic development and proposed that the two nations further strengthen their ties. He added that Vietnam, at the invitation of Japanese Prime Minister Shinzo Abe, will send a high-level delegation headed by Prime Minister Nguyen Xuan Phuc to Japan to attend the G7 Summit in May 26-27, and is preparing to welcome a visit by a ministerial-level delegation from Japan to Vietnam later this year. President Tran Dai Quang also expressed his hope that Japan will continue to support Vietnam as it seeks to protect its rights in the South China Sea in the face of Chinese expansionism.